The Hawker 800XP is the third generation model of the lengthy heritage of the 800 series, and is designed to complete coast to coast flights with a high loading capacity. The cabin comfortably seats up to 8 passengers in a four-person club style interior layout with fully adjustable seats for casual conversations or business meetings. The aircraft also features a separate lavatory in the rear of the plane and a baggage compartment large enough to accommodate eight small soft-sided pieces of luggage. 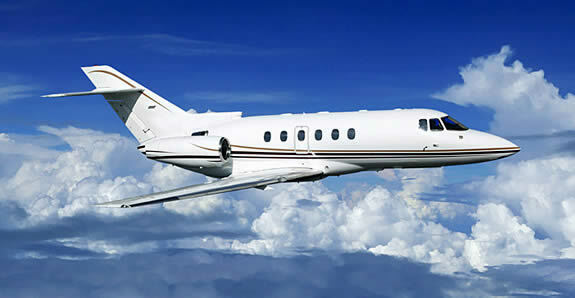 The Hawker 800XP is a good balance between fuel economy, climb and cruise performance and takeoff distance. The cabin comfortably seats eight travelers, typically in four-person club style seating, a three-person divan, and one forward-facing seat. The seats are fully adjustable and can swivel 360 degrees, for casual conversations and business meetings. The cabin measures 21.3 feet in length, 5.7 feet in height and 6 feet in width, including a separate lavatory which is located in the rear of the plane. The baggage compartment is large enough to accommodate eight small soft-sided pieces of luggage. The Hawker 800XP features a good balance between fuel economy, climb and cruise performance, and takeoff distance. It is also one of the most popular aircraft choices when planning a flight that can range between four to five hours. For Hawker 800XP charter rates and availability, please submit the flight request form or call our agents at 1-877-281-3051 for 24/7 support.